There are split opinions and very opposing attitudes when it comes to vaccination. On the one hand, parents are worried that vaccines can cause serious problems to their children based on information about adjuvants and other things that are stated on the vaccine labels. On the other hand, parents come to proven conclusions of vaccinating their children regularly in order to protect them from horrible diseases such as polio and then common highly contagious ones like measles. 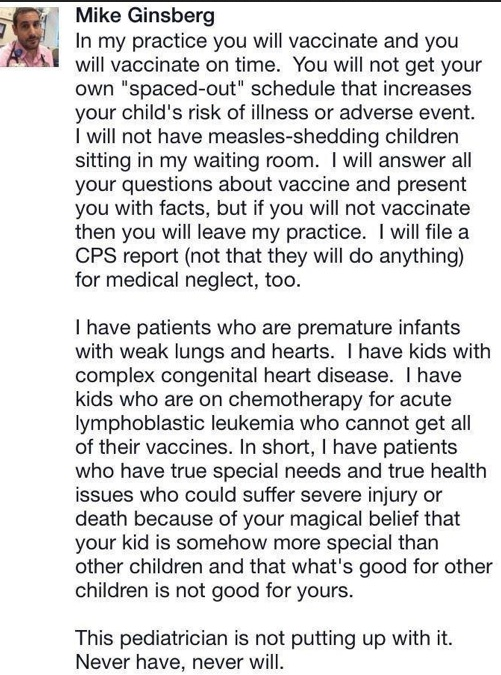 One pediatrician’s message went viral and drew enormous attention. Mike Ginsberg, a pediatrician from Vacaville, California, wrote in his Facebook post he would refuse any patients who were not regularly vaccinated. His post was picked up by a Facebook A page called ‘Skeptics’ Guide to the Universe’ which got a massive wave of traffic started. Ginsberg also says in his post he is willing to educate the parents and explain the importance of vaccination. But, if the parents still choose to refuse the vaccination, he won’t accept them as patients. He also warns he will report the parents who refuse vaccination to CPS(Child Protective Services). The doctor concluded his FB post with the sentiment that he would not put up with any different feelings on the matter and “never will”. Obviously, this is a very heated debate, where many politicians and even hollywood stars get involved. Recently Robert Kennedy Jr. teamed up with Robert Deniro on a panel questioning the safety of vaccines. Both individuals are in support of vaccines but want their safety to be completely proven. The CDC states through many reports that there has been no link between autism and vaccines, which many parents are afraid of. What do you think about this statement, and about vaccines and their safety?